HealthEngine is growing. We have a big vision for the future of the company, and in order to make that a reality, we need top talent to join our team. What is a tech startup to do when that talent isn’t readily available in Australia? Expand our scope and reach out to potential HealthEngine-ers across the globe. Looking for talent outside of Australia opens up a world of experienced candidates who offer a wealth of knowledge which can be fresh and different. We set our sites on the United States, specifically in cities known for their clout in the tech industry. Historically and today, the U.S. is the world leader in tech startups, with venture capitalists funnelling more than $48 billion into U.S. tech startup companies in 2015 alone. All of this funding means startups can offer great amounts of learning and development for their employees, expanding their skills and ability for innovation. The U.S. tech industry now employs more than 6.9 million people. The sheer number of American workers in the tech startup and tech industry shows us we need to be recruiting stateside talent to come work for us in Australia. American tech candidates bring experience and knowledge to the field, with skill sets we are indeed lacking in the Australian talent pool. In return, Australia offers a quality of life set amongst a beautiful backdrop which American candidates are drawn to. When it comes to tech startups, Northern California certainly reigns supreme, with about 50 percent of national venture capitalist funding (that $48 billion we mentioned earlier) making its way to Silicon Valley and San Francisco. The city of San Francisco alone is home to around 392,000 tech workers; making it one of the biggest tech hubs in the U.S.
Plus, we know a lot of folks aren’t all that happy about President Trump or his agenda and are more open than ever to overseas job opportunities. 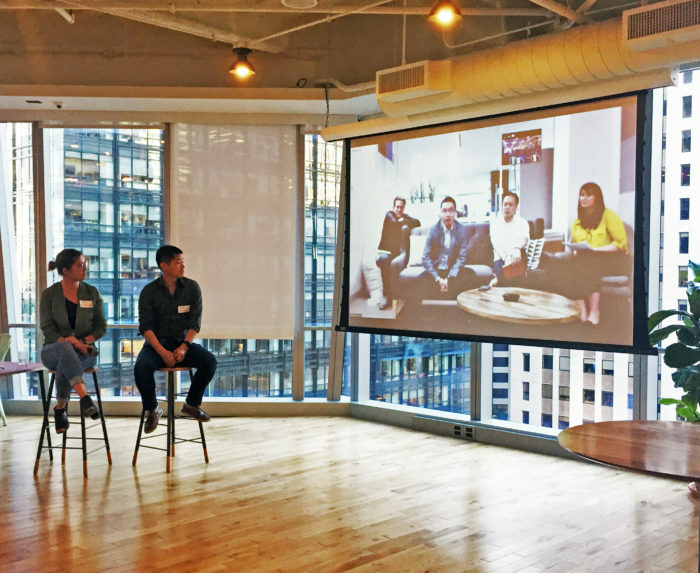 Recently, we crossed the Pacific (physically and digitally) to meet a group of San Francisco tech professionals in hopes of enticing some great minds to come work with us in Perth. We got our CEO Dr Marcus Tan, Co-founder Adam Yap, and Executives Mark Hammond and Lori Tyrrell together to speak on what makes HealthEngine a unique and exciting place to work: our roots, our success so far, and our vision for the future. We then opened the floor to the audience to speak with our panel directly about what they wanted to know about HealthEngine. Here are the best questions and answers from the session. Tell us a bit about the business, from the perspective of tech first vs business first, and also a bit about your tech philosophy. We respect everyone in health and we know that you can’t make health work without involving everybody, but the patient is the centre. And that’s actually a huge shift which is currently happening in the market, and we know that HealthEngine will play a big role in changing healthcare toward a patient-centric healthcare model. Our focus over the past five years was building a marketplace. We had a really simple value proposition which was: buyer, seller, meet in the middle. Therefore, we were completing the journey to get lots of buyers and lots of sellers, in order to reach critical mass. As we near that critical mass, we have started shifting our focus away from a sales and marketing led organisation and toward a product and engineering led organisation. So we have really bulked up our senior engineering team. This is the point of transition which we are at currently. In the future, we will absolutely care about and focus on sales and marketing, but HealthEngine is now a business which is opening its eyes to innovation and product development and being engineering led. Fundamentally, we want to create a compelling product proposition and push it to the marketplace. Can you please tell us about your tech stack? HealthEngine is using AWS with a well-trodden path of tech. We are looking for world-class engineers to focus on building our PHP e-commerce site, C++ on-prem connectors and our native iOS and Android apps. We are dealing with both curated and complex applications focused on practice management, practitioners, patients, user experience and engagement, growth and analytical marketing, and internal systems (corporate IT). We are looking for applied technologists more than research technologists. What should you do if you don’t see a position advertised on the HealthEngine careers website which suits you? If you don’t see an opportunity advertised which suits you, that doesn’t mean we aren’t looking for your area of talent. We have an expression of interest ad on our careers website which we urge you to go to. Put an expression of interest in and let’s talk about what you can bring to HealthEngine, how you can help a startup like us. We are happy to have this conversation with anyone who is interested in our company. As an employee, what do you like about working at HealthEngine? As a manager, what type of people are you looking to hire? What I love about HealthEngine is that we have three core values generally throughout the company. The first is passion. We have a lot of very dedicated people on our team who are passionate about fixing the healthcare system, and we know that we as an organisation can solve the problems we see in the health system. The second is agility. We move fast and we change fast, the teams will change, our structure will change and our focus will change. This means we get things done quickly and are able to focus on the problem at hand without being bogged down in too much structure. The third is learning. No one person in our company has all the answers. There is a lot of information out there that we can all learn as individuals and then bring back to the company, and that is what we do. From a manager’s perspective, we are looking to hire individuals who hold these values as well and can contribute to growing our organisation. To stay in the loop on upcoming events head, join our collective here. If you’re interested in career opportunities with HealthEngine, visit our Careers page now.